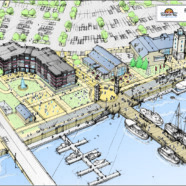 Sturgeon Bay west waterfront to see $17 million in improvements soon | Vandewalle & Associates, Inc. DOOR COUNTY DAILY NEWS: Sturgeon Bay’s downtown waterfront could see more than $17 million in improvements soon, including a new boutique hotel and public amenities. Vandewalle & Associates’ Jolena Presti explains the project at this planning commission public meeting. A “4-season market” concept was presented as part of the overall Waterfront Development Plan. Over 80 people attended at the Sturgeon Bay High School Auditorium.